Not long after posting the last part of this build log, I discovered that AlphaCool distributed their own decoupling fastener kit. Four fasteners, screws, washers, and nuts. Everything M4 thread. Specifically the AlphaCool SKU is 13701. They make another one that is similar, but with male threads on both ends instead of a male and female. Decouplers are basically two fasteners connected by a rubber cylinder, and prevent virtually all vibration from being transferred from the object to its mount, provided they’re used with objects within their specifications. In the original setup for this radiator box, I initially had the pump mounted to the floor, but with double-sided 3M VHB tape. There was virtually no vibration isolation. And with the second revision, the pump was mounted to a UN Z2 bracket with 00 rubber washers providing some vibration isolation, but not anywhere near the degree needed. The entire case vibrated, and you could feel it by just resting your finger on any panel. Mounting the pump using the decouplers required drilling a few holes into the aluminum panel using a 3/16″ drill bit for the M4 fasteners. Along with the vibration decouplers, I retained several of the rubber washers for additional padding and isolation. So how well did it work? Previously virtually the entire chassis was vibrating while now it no longer is. But there is still a significant amount of vibration being transferred from the pump to the bottom panel. And that vibration is also still being transferred up the sides. Initially this was causing a large amount of noise, but it settled after several hours. 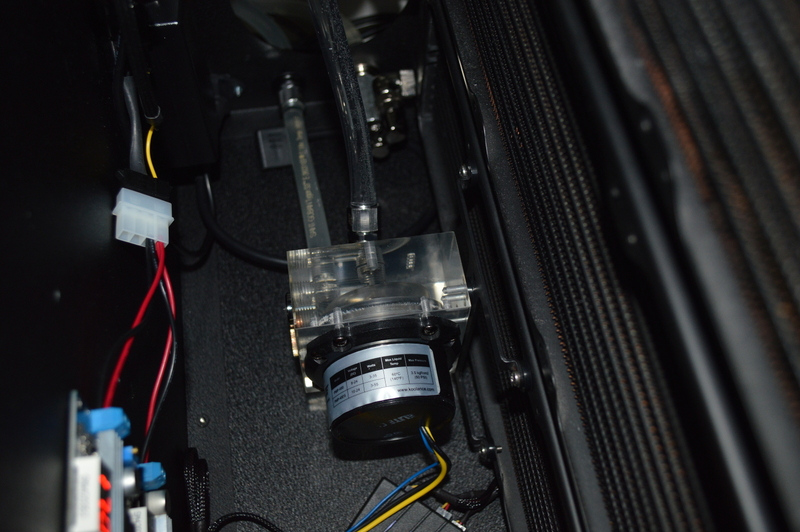 Initially I had the pump running at the 16.5V that Martin’s Liquid Lab specifies provides for maximum flow. I turned it down to 12.5V and that reduced the vibration significantly and I left it overnight and the vibration noise on the pump was virtually gone. The pump itself, though, is still being loud, and there is still some vibration transfer between the pump and bottom panel that is creating noise. I currently have Startech’s case feet on the bottom panel. These aren’t made for anti-vibration. And I wonder if the vibration I’m feeling in the case is actually feedback. Perhaps changing them out for anti-vibration feet, such as the AcoustiFeet by Acousti Products, would virtually eliminate the vibration. By the way, having the flow down that far didn’t sacrifice temperatures in the least since it’s just the CPU being cooled currently. I ran another video conversion using Handbrake and the temperatures stayed in the upper-30s°C, occasionally touching at 40°C or 41°C, with the fans down to 6V and the CPU pegged at its 3.6GHz boost clock. There’s been some back and forth on this, and there are competing sides wherein one says that pump speed does matter while others say it doesn’t. JayzTwoCents actually called it a “myth” that pump speed affects cooling performance: “increasing your pump speed does not increase the cooling capacity of your system”. He also tries testing pump speed and temperatures in a later video. And ends up showing that it does. Sure it doesn’t increase your cooling capacity, since that is determined by your radiators and the overall fluid volume in your loop. I’ve seen “cooling capacity” misused time and time again when the person saying that actually means “cooling capability“. And on that, pump speed absolutely matters. To a degree. And that degree is called resistance. Most blocks today actually have a pretty high resistance to flow. Especially CPU blocks. If you don’t have a pump that can push through that resistance, you’ll end up with poor flow, which can translate into temperatures not as good as you could otherwise get. For example if I exchange the D5 Strong for a D5 Vario, run it at 12V, and have it at level 1, I doubt I’d get any flow. Because I doubt it’d be strong enough to push through the resistance it would face. It’s why aquarium pumps aren’t used today for water cooling. Which it’s a minor shame since they’re submersible, eliminating the need for a separate reservoir. But most, especially the inexpensive ones, don’t have the head pressure to push through a loop with a modern CPU block. And the ones that do are likely unacceptably loud. I have the D5 Strong due to its higher line pressure to overcome resistance. That resistance initially being two GPU blocks in parallel and a CPU block (EK Supremacy EVO) plus three triple-120mm radiators. And let’s not forget having to push that fluid against gravity. There was also a flaw in the original design that didn’t help things. The original radiator box design had case fans pulling air into the chassis as an intake. The fittings between the radiators were toward the rear of the chassis near the bulkhead fittings. As such there was a major source of restriction that also impacted flow greatly. I’m not sure how well you can see it, but look in the upper-middle of the picture. That fitting configuration that is out of focus is comprised of several fittings: an extension fitting going to a Koolance 180° fitting, to another 90° rotary fitting before entering the radiator. That was a tight setup. And all of that resistance to flow was too much for the D5 Vario at 12V, and I never tried putting a voltage up-converter on the Vario to get it higher. The CPU temperatures on my FX-8350 would climb into the upper-50s and lower-60sC under load. So I swapped it out for the D5 Strong, pushed it over 12V, and saw a drastic reduction in temperatures. Above a certain point, though, pump speed won’t matter. But that point is determined by the components and design of your loop. More resistance requires a stronger pump to see the same flow level through your loop. And that flow level is one of the factors in your loop’s cooling performance. I overcame that design flaw when I revisited the radiator box with Mira. I turned everything around so the radiator fittings were at the front of the chassis and the case fans acted as an exhaust at the rear. 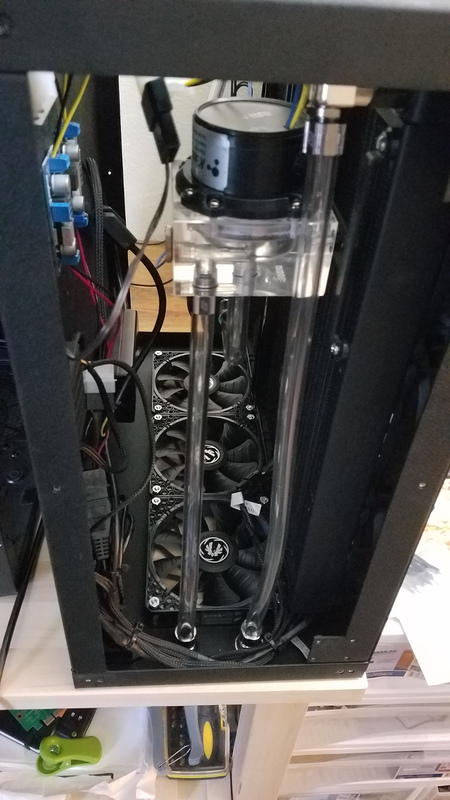 This allowed a long piece of tubing to go from the return bulkhead to the radiators, drastically reducing the flow resistance by eliminating the tight bends. As such, this has me wondering about switching the system to a D5 Vario. Neither pump can run below 12V. And while the Strong at 12V is more powerful than the Vario at level 5 at 12V, the difference isn’t significant, but the Strong maintains better line pressure. At least the Vario at 12V allows you to control the pump speed to as low as you need it, allowing for better control over noise and vibration. But till I get the GPU block, I can’t know whether I can make the switch. Temperature performance on the CPU and GPU blocks will be the determining factors in whether I can keep the pump turned down low and possibly switch to the D5 Vario to have it turned down further. If it introduces too much resistance such that I have to retain the D5 Strong, then I’ll need to look at some way of damping the pump’s sound. 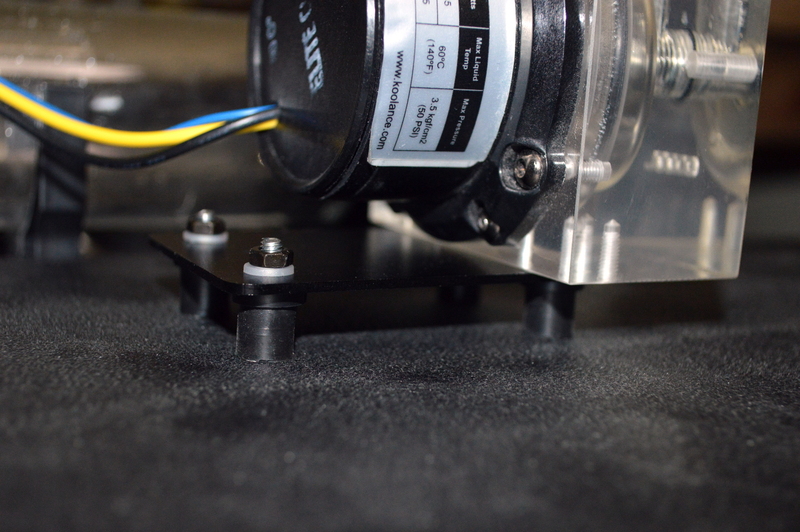 While it appears they may not be ideal, the AlphaCool decouplers are working to isolate a lot of the vibration. You’ll never be able to completely isolate all of it, but you obviously want to minimize the vibration transfer as much as possible. AquaComputer distributes their own set of decouplers allegedly made with a softer rubber. I’ve also seen decouplers that are made for RC applications that use clear silicone rubber. These may provide for a much lesser vibration transfer based on my research. I went with AlphaCool’s decouplers first because they were less expensive. Karmann Rubber gives a good synopsis on shopping for decouplers: excessive under-load of the fastener will actually not provide satisfactory isolation, while overloading can cause it to fail or fail prematurely while also eliminating any potential isolation. There are several terms involved here as well, with spring rate, compression load, and shear load being the more important ones. You want to find a decoupler with the lowest spring rate that supports the shear and compression load it’ll bear. The compression load for a D5 pump is the weight of the pump plus its housing, about 2lbs to 2.5lbs. Shear load varies with the pump RPM. Softer materials tend to have lower spring rates, but at the trade-off of supporting lower compression and shear loads due to lower density. To a degree. So the softer rubber of Aquacomputer’s decouplers might allow for greater vibration isolation for a D5 pump and the lighter DDC pumps. Provided they are actually softer. According to one reviewer on Performance-PCs, AquaComputer’s set is identical to AlphaCool’s decouplers (item no. 13505), just a different color. So perhaps I just need to find something else. But the problem of under-loading an isolator is also important to keep in mind. With the AcoustiFeet, for example, you don’t want to buy the kit rated for 70lbs for an HTPC build that weights just 15lbs as it probably won’t provide for any isolation. You want to buy isolators that are rated for a compression and shear load about around what is experienced to get the benefit. It’s kind of like the “Price is Right” in that matter: get as close as you can without going over. With the GTX 1070 in the system, the CPU is now the only component on the 9x120mm of radiator space. Currently I’m using distilled water with copper sulfate as the coolant, though I’ll be swapping over to PrimoChill’s coolant concentrate. The small bottle that comes with their tubing that gets mixed into a gallon of distilled water. Just simply because it’s easier. I don’t have enough Mayhem’s X1 on hand for this and am not planning to order more. So the wait now is for figuring out the full-cover block. According to EK, this particular GTX 1070 is a reference card, and NVIDIA did the super-smart thing of building the GTX 1080 and GTX 1070 using the same reference design, making all GTX 1080 reference blocks instantly compatible with any reference GTX 1070. Talk about a win. So that means I can go with the same block I used in Absinthe: the Aquacomputer krygraphics. And that’s likely the direction I’ll be leaning on this. Hopefully without having to order it from Germany. In the mean time I’m also going to be continuing research into vibration isolation to see if I can completely silence this D5 Strong pump. Provided I need to keep it. If having this pump down at 12V still provides for adequate flow across the entire system (temperatures will be the determining factor), then I may swap it out for a D5 Vario, which is a lot easier to keep quiet due to its lower RPM. So it’ll be interesting to see what the next couple weeks brings.